I spent last week in the middle of final preparations for Contagion, a zombie-themed 3-gun event that I've helped staff for three years now. While most of our nearly 150 participants only see what happens on match day, there's a lot that goes into making the day enjoyable for everyone. For this particular shoot, core staff members work nearly year-round to put on each year's event, which is part new shooter day, part competition, and part costume party. Contagion is a somewhat unusual event in that new shooters are not only accepted, but specially welcomed. While almost all shooting events and competitions are reasonably friendly to newcomers, few are targeted especially to less experienced shooters and fewer still are as "come as you are" with respect to gear. At the same time, we work hard to keep the course of fire interesting and challenging to regular competitors. More so than the other matches I'm involved in, our guests come with a wide range of ability and equipment and with them, a "wildcat rules" system that is specific to our event. This requires an immense amount of planning in course of fire design and match logistics to ensure a safe and fun day for both participants and staff. Individual stages are conceptualized up to nine months in advance to allow for time to refine what we will ask of each competitor and to buy or build necessary props. This year, our team put together everything from custom cut steel targets to miniature wooden staircases. 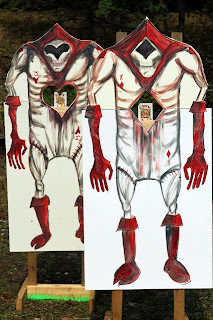 In a nod to our zombie backdrop, a significant amount of art was also created for atmosphere, particularly for my Alice in Wonderland-inspired stage. 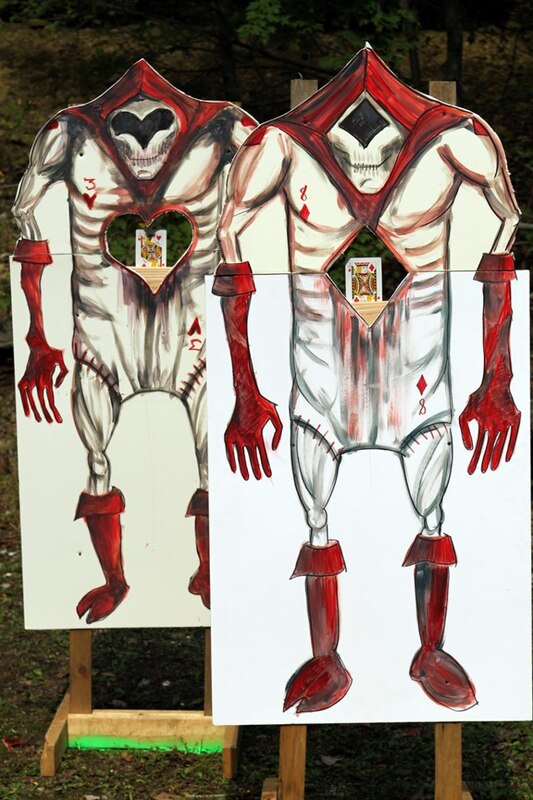 For example, each of the playing cards presented as targets were set in large paintings of the Playing Card characters. Stages may continue to be adjusted right up through the end of staff shoot, less than 24 hours before our guests arrive. Shifting targets or shooting positions aren't the only finishing touches to be put on a major shooting event, though. All of the other logistics you might imagine for a large gathering of people also must be arranged in parallel with the stage design efforts. Everything from making sure food and drinks are available to having extra porta-potties on site is important, as well as more match-specific considerations like putting together participant swag and prize bags and arranging for medics to be available for injuries from dehydration (common!) to the unthinkable gunshot trauma (thankfully extraordinarily rare!). On the day of the event, most of our shooters primarily spend their time with the safety officers running each stage. However, they aren't the only people responsible for making the match run smoothly. The safety officers are supported by staff members who run food, water and other supplies so that the safety officers can concentrate only on running their stages safely and consistently. Stage staff and shooters are also supported by a dedicated administrative staff for smoothly-run registration and scoring, as well as senior range staff providing event-wide oversight and, if necessary, troubleshooting to make the day as seamless as possible to guests. So next time you make it out to a match, thank the staff. They've put in more hours than just what you see on match day. When I first started competing, I often looked a little sideways at all of the fancy guns people brought and the complicated-looking gear shooters strapped on to their guns and themselves. Why would anyone need all of that "stuff"? Did better toys make for better shooters? Not directly. You can't buy your way to being an expert marksman because your physical and mental technique underlies your success as a shooter, no matter what gun is in your hands. However, having the right gear can help in a couple of ways. First, it can be more forgiving of mistakes. When I started shooting IDPA, I used my Sig P226 DAK with a 6.5/8 pound trigger (and I do use the short reset, so I spend a lot of time with that 8lb trigger). The results weren't pretty. Not only was the gun too big for my hands, making certain manipulations suffer, the long and heavy trigger amplified the many beginner mistakes I was making under the stress of the timer and the movement. After watching my frustration mount because I was having trouble even hitting targets, I was switched to a Smith & Wesson M&P 9L with an Apex Hard Sear. My improvement was almost instant. Not only did the dreaded Failure to Neutralize disappear almost overnight from my score sheets, my times dropped at the same time. I didn't suddenly become a better shooter, but my new gun was simply nicer about problems like my tendency to drop shots under stress with a big gun and heavy trigger. And not having to fight that particular battle helped give me enough positive feedback to keep going back for more matches. The right gear can also help set you up for more successes even when you aren't battling your own problems. You can be nailing your technique, but picking up that drop-and-offset holster and those fancy mag pouches could shave a precious tenths of seconds off your draw and reload because the draw stroke requires a few less contortions and you aren't inadvertently grabbing an extra magazine. Shelling out for the PMAGs might save you from having to clear an extra malfunction or two when you're using a rifle magazine as a monopod for a long shot. Buying a quality optic and pairing it with a solid mount will help prevent your groups from suffering because you can't clearly see your target or because your zero is wandering. You can do everything right but if your gear fails you, you'll still be at square one. And at the end of the day, not having to fight your gear can make a day on the range far more enjoyable and allow you to concentrate on really making sure you're doing your part instead of getting your gear to work for you. Oh, and my Sig? I installed the E2 grip kit and expect to be bringing it back out for matches soon. Don't fear the gear that wasn't right for you in an earlier life either. Gracefulness on the range isn't a function of one's natural ability to move beautifully. Which is fortunate since I'm a woman who has been known to trip over perfectly flat floors and walk into large, unmovable objects. However, over time, I've been able to integrate movement with my shooting and look pretty doing it because it's a skill that can be learned. When you shoot an action sport, you will often either have to shoot while you are moving, or move between shooting positions. Shooting on the move requires two things: solid fundamentals and practice. If you cannot consistently make your hits when standing still, it's unlikely that you will be able to do so while your feet are going. Work on that first, then start adding movement. There are a lot of techniques to improve accuracy while you aren't on a stable platform. I encourage you to try each one you are exposed to, then try them again. What works for you with pistol might not work when you're shooting a rifle, and what works for you today might not be the best option for you in six months. Once you've found something that seems to get decent results, work at it because shooting on the move can only be improved by shooting on the move. Most shooting on the move "tricks" are intended to make movement as smooth as possible, which is why the particular one you choose doesn't matter so much as nailing down the technique that makes you move most smoothly. Jerkiness at the feet translates almost directly into jerkiness at the sights and inconsistent groups. Moving between shooting positions does rely quite a bit on your physical abilities but no matter what your physical limitations, you can still benefit from working on moving as efficiently as possible. And don't forget the finer movements inherent in shooting like drawing a pistol, racking slides or bolts, or loading ammunition into a firearm. Efficiency matters with that type of movement too, and the key there is to find a consistent and repeatable way to perform every action. While a specific way of locking back a slide/bolt may feel awkward at first, with practice you will find the specific movements that work for you every time and they will feel more and more normal. Much of the grace you see in top shooters comes from the fact that they don't waste time and energy with extraneous movement. Instead, they pick the shortest line between two points and the most natural movements to reach for and manipulate their gear. Focus on finding those efficiencies and your shooting will also become more graceful. Don't believe me? Use one of the favorite tools of the moment and have someone take video of you shooting a few stages, then do it again in a few months or next year after you've worked on making your movements smoother and more efficient. Watching yourself from a third person point of view will help you evaluate yourself more neutrally, instead of relying on your memories of every little bobble and stumble. And as you shoot prettier, you'll find as I did that learning to move gracefully on the range is also learning to shave wasted time off your scores.